As Aspen locals, sometimes we get to experience things that the 2nd homeowners and tourists just don't. Last night was one of those special events!!! Red Bull and Aspen Skiing Company partnered up to present Illume--image quest. What started as a simple idea to celebrate action sports photography and the people behind the lenses, evolved into a world-wide contest with thousands of entrants from 90 different countries. The 50 best action sports images were chosen for a unique and spectacular exhibition at the base of AJAX. The 50 photographs are being displayed on 8 foot tall illuminated boxes through February 4th. If the 400 step climb to the viewing platform doesn't take your breath away, the photographs certainly will. The exhibit is a work of artistic acheivement, engineering prowess and it's truly awe inspiring. If you have access to a private jet---get out here before February 4th to see Illume for yourself. No Plane? You can check it out on-line at www.redbullillume.com and you can vote for your favorite shot, too. The VIP-only opening night event was SICK!!! Aspen Spin was fully media credential-ed, so it was ALL GOOD. We got "all jacked up" on Red Bull and Vodka and gorged on the gourmet finger foods catered by The Little Nell. 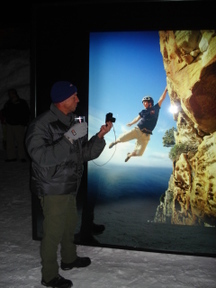 The event was fantastic in every way, the physical setting atop the ski run, the larger than life photo displays, the killer heated tent and the open bar all contributed to the raucous atmosphere. We met all the photogs and the athletes, and there were almost enough hotties to go around. Many thanks to Wil Tidman of One L Productions for keeping us in the loop. The after party at 39 Degrees, at The Sky Hotel was off the hizeeeee. More open bar, and a crazy party atmosphere that helped to renew the human spirit. Who knew that world class shutterbugs could drink their faces off with the best of them. The party rocked into the wee hours. Alas, today is another beautiful ski day--so we concocted the ASPEN SPIN, ski bum's breakfast----Red Bull and Cheerios. It seems to be working ----for now.